On construction sites, excavators can often collide with objects while maneuvering or reversing due to reduced visibility around the rear of the vehicle. The driver assistance system’s sensors must, therefore, be able to classify objects and their relevance to the collision warning system. They do this by calculating object volume. 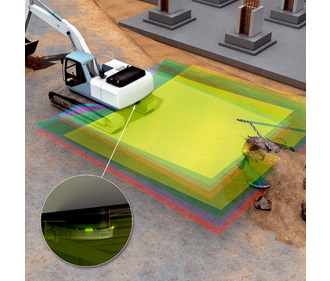 The MRS1000 3D LiDAR sensor features an IP67 enclosure and detects up to 55,000 measuring points across four layers, enabling it to recognize objects standing on the floor or located in the vehicle’s travel path in plenty of time. Cutting-edge HDDM+ technology with multi-echo evaluation guarantees precise measurements, regardless of the weather conditions.